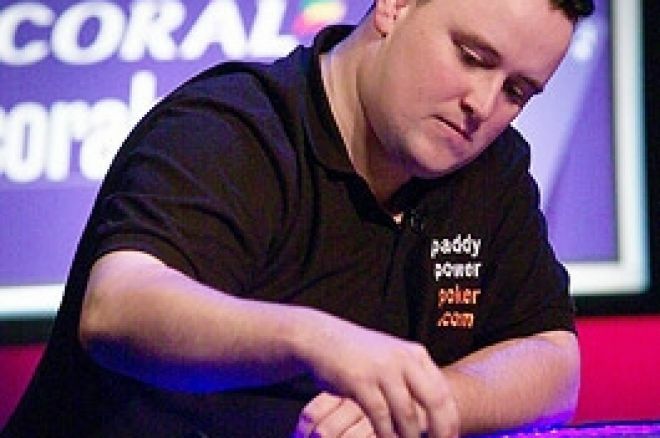 UK Poker News concludes its enlightening chat with rising Irish poker player, Oliver Boyce, winner of the World Speed Poker Open 2005. In this final part of the interview, Oliver tells us about his online poker experiences, how he plays them for profit and why he wants to play more live games. Oliver also offers his advice to less experienced players who want to improve their online game and perhaps play live too. UKPN: With all the high-profile live events you have been involved in lately, it is easy to forget the "bread and butter" of making money on-line, but I understand that is something you do for the most part. What is your preferred poker room on-line, if indeed you have a preference, and why? OB: Well there are a couple of things I do different to most professional players online. First, I don't multi-table, I've tried and found it's a skill in its own right. You need to be doing it more for cash games and only playing premium hands. My strength is STT and then I like to play tourneys. The tourneys give you the higher value in wins and I try to get a result in these once a week. Other times I play cash games or STT's. My main target at the moment is to qualify for EPT, WPT or other major events from online qualifiers. I want to get as much experience playing in these events as possible over the next 2 years and see if I can develop into a top class pro player. I've accounts with most sites, but I mainly play on Paddy Power Poker (due to my success on this site and the familiarity with their structure and players), Ladbrokes (due to the quality of events and players) and Poker Stars (again due to the quality and players but mostly for their online qualifiers for major live events). UKPN: Do you prefer to play ring games or tournaments on-line, and at what stakes? OB: Even with my win, I still class myself as a learner to the game, but I've managed to win successfully online for a year now, so I've moved around the stakes as I get more confident. I started playing ring games at $1/$2 and have now moved up to $3/$6 and sometime $5/$10 in hold'em. I like playing STT at $100 a time and find this very profitable. I love playing tournaments and always look for the good value games, but you have to be able to plan this, as it can take 6 hours to win a 300 player tourney. My current aim is to improve my live game, so I'm trying to move away from online. I think you need to mix them well and give your mind a rest from online, as the value of money and the game itself can become a bit unreal. UKPN: What do you look for in your opponents before deciding which tables to play? OB: I always look for a table with one large stack and a few medium stacks in relation to the buy-in, the large stack might be a bully and you can always wait to catch this player out or bully him back. The short-stack players are usually on tilt or don't have the bankroll for that level and to put them all in doesn't cost you too much on a bluff or a premium hand. I would rather play the more aggressive players, as they don't know when to stop pushing, I also like to try and tilt people if I push them off a hand. UKPN: Many people reading this may be relatively new to on-line poker. What advice do you give to someone with a genuine desire to increase their on-line bankroll over time, as opposed to simply playing for kicks. OB: The first thing to do, is learn and study the game a bit, go out and buy a book, Dan Harrington has two excellent books on the subject and they are very good value for beginners. I've a collection of books and read everything I can get my hands on. Also, don't believe what you see on television, as this is cut to show exciting moves but misses out on all the hard work beforehand. Also, stop chasing hands, or playing connected cards or suited cards. Play quality hands, this will make the decision after the flop easier for you and make notes on your opposition and don't get into the habit of protecting your blinds. Also, if you're going to bluff, don't bluff to a better player and bluff with intelligence, i.e. bluff a hand that the player would put you on. Also, learn pot odds and hand odds, these will teach you so much. Play a level of game that interests you, if you are playing 10c/20c, there's not much fun betting $1 on a full house, play stakes that will keep you interested, but don't break your bankroll and don't move up the stakes too fast, there is a difference in quality of player. UKPN: What is your advice to an on-line player who wishes to try their hand at live tournaments or cash games, where the human psychology factor can be off-putting for those not used to it? OB: This is something I'm still learning myself and it's a lifetime of experience that is required. The first thing is practice makes perfect, so play as many games as possible, the buy-in isn't that important, but the higher the level the better. Also, be aware of your body language and this can be used in a positive way also, i.e. to get a caller. I like to chat to the players and get information from them, what poker books they've read, where they play, do they play often etc. Also look at how they dress and what they do for a living, it's all about gathering information about someone and analysing it. But the most important thing is not to allow someone to tilt you, by aggressive manners or rudeness in general, and always be and look confident. The most important things are peoples starting hand, betting patterns and the time they take to make a bet. A long time is usually a strong hand and too fast is also a sign of a strong hand, so figure out all these tells and play your game to suit these. Be patient, live poker is a lot slower than online poker and if you have the nuts, make sure you get paid, the all-in might scare a player so bet what you think he'll call, we call this an extraction bet. UKPN: Finally, Oliver, after such an exciting year, what are your goals in poker for the longer term? OB: I set myself three targets for 2006, one to qualify for the WSOP which I've now achieved, two was to continue winning online and clear a certain profit for the year, the third is to defend my World Speed Poker title and try to get past heat one and give a good performance. Ideally this year is about improving my game and at the end of this year I want to be able to see what level I can play consistently at. I would love to play an EPT this year and maybe a WPT next year. But to be consistent is my real aim and see if the game can give me a career and be profitable. I don't want to be a player that over performs and then loses the winnings in the following year, this has happened to many players over the years and my goal is to learn how good I am and how good I can be. The WSOP will be a really good learning curve for me this year and I'll review my progress at the end of 2006, but 2005 was a massive success and I'm just hoping to repeat it. UKPN: Oliver, it has been good to talk. Hopefully, we can catch up after the WSOP! Thanks for your time and UK Poker News wishes you every success in poker. OB: I would love to talk to you after the WSOP and it's been a great pleasure to talk to you and to your readers. Ed note: Join Oliver in Las Vegas by qualifying with Bet365Poker for every WSOP event.